It’s no secret that our society is in bad shape when it comes to eating habits. Ever looking for cheap ways to flavour and bulk up their offerings, food companies load their processed goods with sugar, salt, fat and other starch-based fillers. It’s easy to market them, too – they have a consistently reliable taste and texture that we’re used to, they’re quick and easy and hey, if you throw in 10% of apple juice concentrate you can claim your sugary, blueberry-pomegranate flavoured candy contains real fruit! As a result, we’re led to believe that the only options are what’s peddled to us, and our health (not to mention our waistlines) are taking the hit. Author and food blogger Amy Green (of simplysugarandglutenfree.com/) was in the same boat for years, growing up in the time of “fat free” everything (which is loaded with sugar) and living an up and down rollercoaster with her weight. Eventually, on the advice of a naturopath and with a lot of determination, she developed a way of life that worked with her body – no sugar, no gluten. Simply Sugar & Gluten Free developed out of her blog of the same name and contains 180 recipes designed to be made in 20 minutes or less. SSGF begins with a rundown of why Green chose this lifestyle as well as a short list of “tips” for using this book to your advantage. It is in this How to Use This Book (p. 4) section that the “20 minute” timestamp comes into question – recipes don’t take into account time to take out or prepare ingredients, baking or unattended cooking, nor do they account for extra time needed if you don’t own certain equipment (namely stand mixers and food processors). 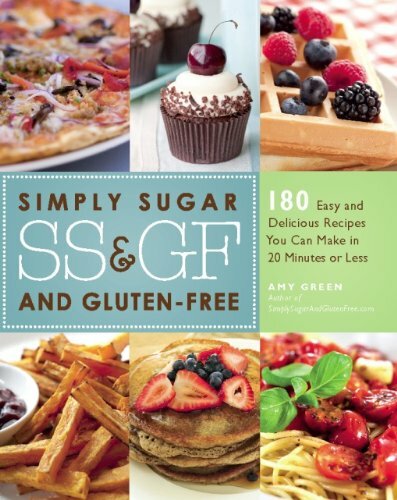 That said, Green also directs readers beginning the sugar- and gluten-free journey to browse through The Simply Sugar & Gluten Free Kitchen Guide (p. 211), which also includes a vital “mini-recipe” for her Basic Flour Blend (p. 212). The list is exhaustingly thorough for the average reader, but thankfully, most of the items are available in bulk food stores (and at the very least, the health food sections of grocery stores). What I found interesting is that the very first section of the Guide is “White Sugar Alternatives”, which ironically contains sweeteners like agave and honey that are commonly just as refined as white sugar. Palm sugar is also included, but not unrefined cane sugar which also contains nutrients such as iron. Green incorrectly notes too that maple syrup has less calories than table sugar (a tablespoon of maple actually contains 6 more than sugar), and neglects to mention that it’s only 60% as sweet as sugar, meaning you need to use more for the effect you’re used to. A more apt title for this book should be Simply Refined Sugar & Gluten Free, so as not to mislead would-be readers. Nitpicking aside, I can say as a whole that I was extremely pleased with the variety and adaptability of the recipes in SSGF. Chapters include Breakfasts (missing from the Table of Contents); Starters & Snacks; Spreads & Condiments; Soups; Salads; Mains; Sides; Cookies & Bars; Cobblers, Crisps, & Pies; Cupcakes & Cakes; Frostings; Puddings and Frozen Desserts. In each section omnivorous readers are essentially spoiled for choice, however most of the Main Dishes rely on chicken and/or dairy products (there are four vegetarian selections and only one vegan option – Socca Pizza (p.84)). As well, a hefty portion of the baking relies on eggs and/or dairy for consistency, which isn’t unusual in a gluten free book. In most cases, cooked recipes are easily adapted to more restricted diets (for instance the Chicken Cacciatore (p. 96) is delicious with cubed tofu or even rehydrated TVP chunks, and leaving the bacon out of the Swiss Chard and Mushrooms with Linguini (p. 104) doesn’t hurt the dish at all), and baked ones are just as simple to modify by using egg and dairy replacements tolerable to your system. There are no photos in SSGF, but the amount of stunning photography on Green’s website more than makes up for the lack of visual inspiration (and has a ton of other delicious recipes to boot – I can’t wait to make her Peanut Butter Hot Fudge Cake (p.166)). 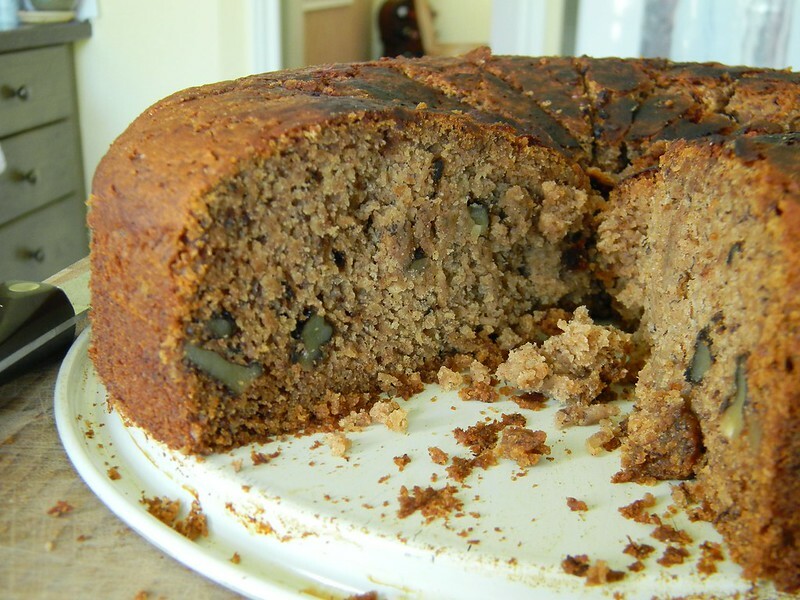 Eager to get into the baking kitchen after enjoying some of the savoury options, I decided to try a veganized version of Green’s Banana Walnut Cake (p.169). 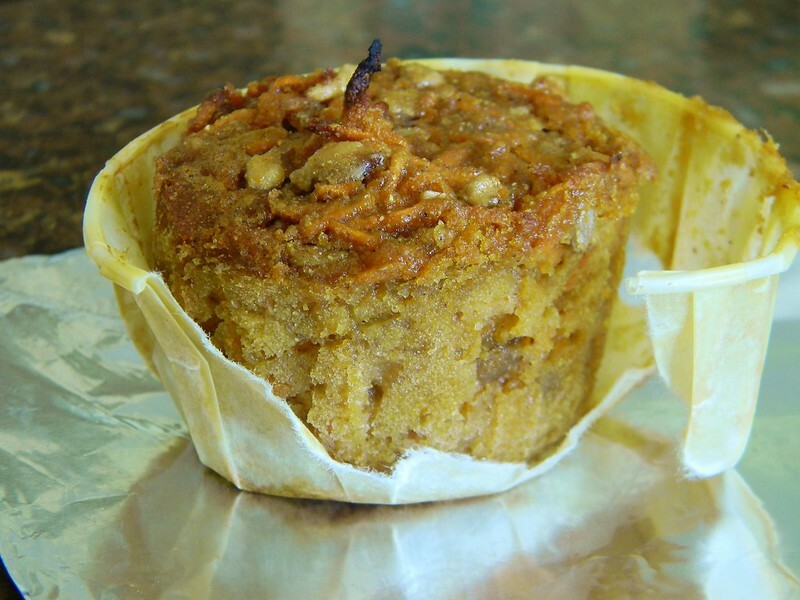 This recipe relies on agave nectar, palm sugar and ripe bananas for sweetness, and doesn’t use any sort of gums for binding (shocking for most baked gluten free recipes). Since the recipe already used almond milk as the “dairy”, I only had to use an egg replacer to fit the vegan label. While we were running low on agave nectar (it’s not something our family uses generally) I combined what we did have with maple syrup and used that, which lent a wonderful flavour. I also found the need to add a few tablespoons of psyllium husk fibre to help bind it a bit more, which has become my usual course of action when baking gluten free and vegan. The cake turned out beautifully, packed with flavour and with a respectable 13.7g of sugars per 1/12th of the cake (a good sized chunk). It was devoured within a few days, and everyone agreed that it didn’t need frosting at all. Buoyed by this success, I tried Green’s twist on a classic favourite – Carrot Cupcakes (p. 159). Again, these relied on agave nectar, but used it as the exclusive sweetener. In addition, there is a deceptively tiny amount of dry ingredients for the amount of carrots, eggs, oil and agave, which can lead you to doubt (as I did) that the recipe would actually turn out. Not only did the cupcakes bake, but they were the sleeper hit of the book. I made them three times in the course of a week, and only once did I get the chance to top them with Whipped Cream Cheese Frosting (p. 172), a decadent combination of agave, cream cheese and heavy cream. In fact, we preferred a simple mixture of cream cheese, yoghurt and a touch of honey as a topping, or simply enjoyed the cupcakes “naked”. Whether you need to be gluten free or refined sugar free for diagnosed medical conditions, are trying to find a “happy body” balance or simply want to control the impact that Big Food has on your family, you’re likely to find something delicious in Simply Sugar & Gluten Free. That said, gluten and sugar themselves are not the only demons in modern lifestyle, and I encourage readers to ensure their dietary needs are met before adopting this as standard practice in your life.